It has been two days since I've been back from Barcelona and I've yet to recover from the trip. It has been a blast and a mini-holiday I won't easily forget. 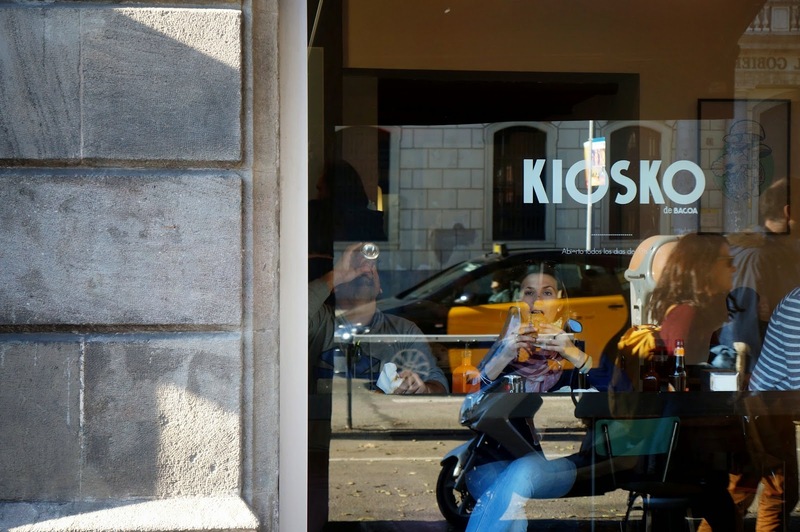 As I'm looking through the photos I've taken, I came to realise that most of the pictures are either of food or random shots of locals minding their own business. I don't know if it's because I'm obsessed with food and the people I was with are as well, but food played a big (important) part of the trip. 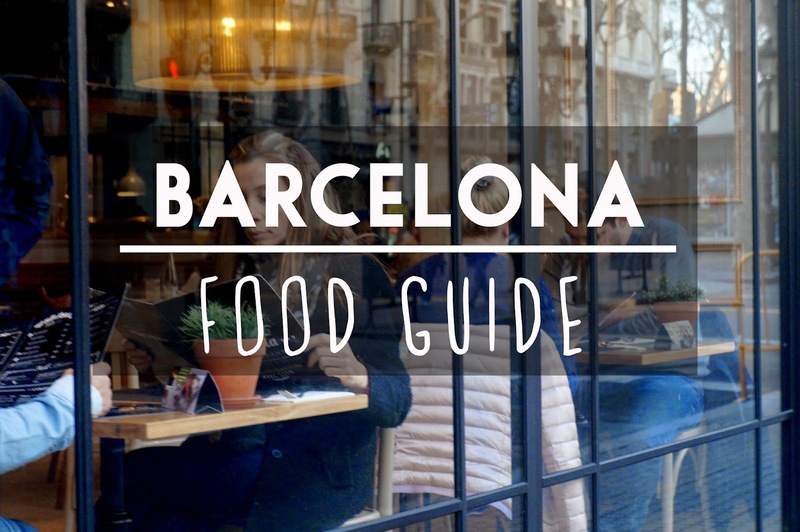 There even wasn't enough time to eat at all the places I've wanted, but I managed to compile a little 'Barcelona Food Guide'. It consists places I thought are worth a visit if you ever decide to visit Barcelona in the near future. Before you go any further, I'm planning to do a 'Barcelona haul' since I've been doing some sale shopping there.. So stay tuned for that as well! 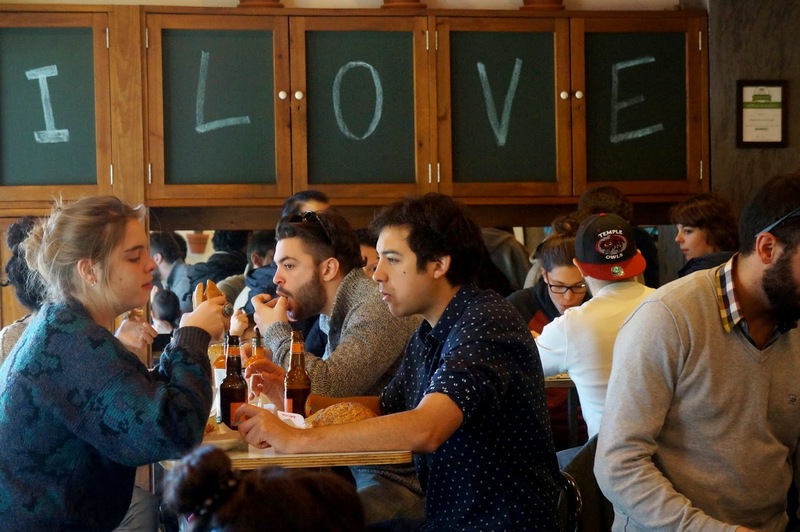 Something every local would say is to stay away from the Ramblas if you're searching for food.. 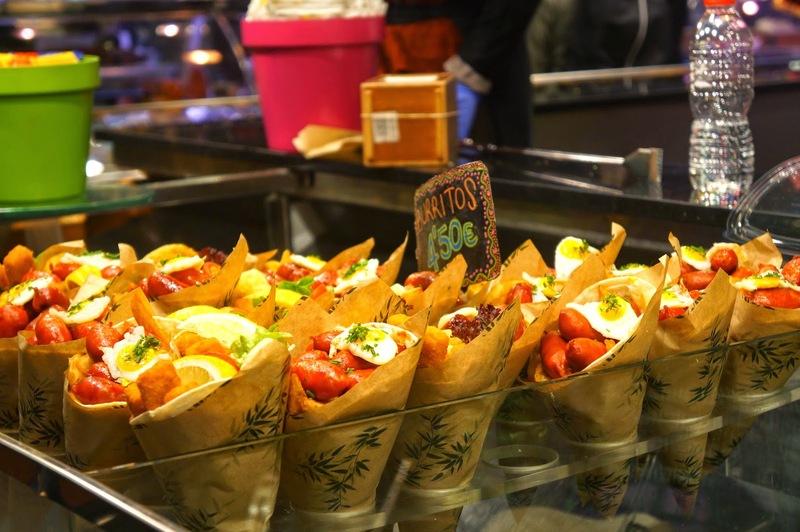 But there's one exception to that rule and it's called the 'La Boqueria' market. It's a market filled with mostly tourists but locals can be found as well. They sell all kinds of things such as herbs, meat, fish, candy and you can even eat tapas there. 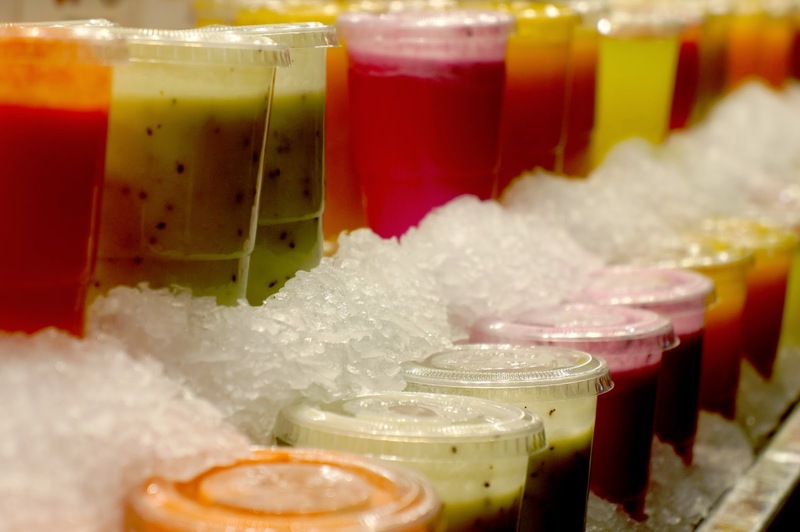 But the thing that got me most excited are the fruits and juices. They're so colorful and bright, that it's impossible not to be tempted to buy one and it's cheap as well. If you buy juice or fruit in the morning it's 1.50 euros and if you wait long enough it can drop to 1 euro. 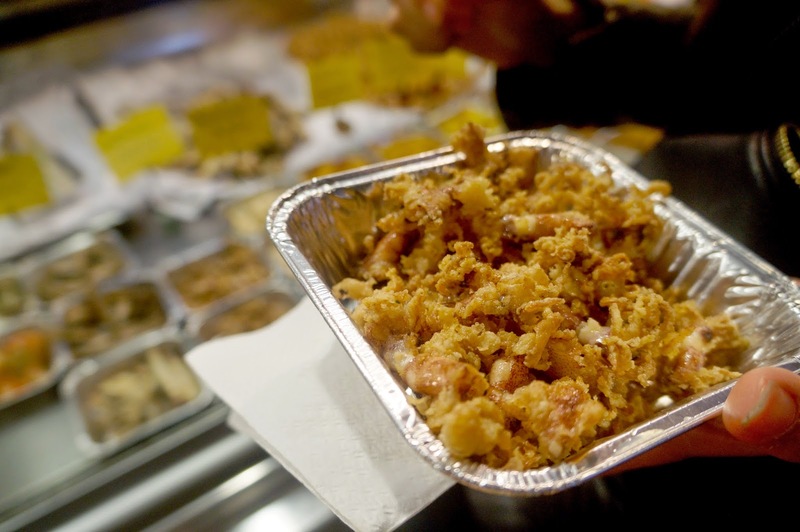 A typical Spanish delicacy I was loving is the fried baby squids. Add some lemon to it and it has so much crunch and flavour. 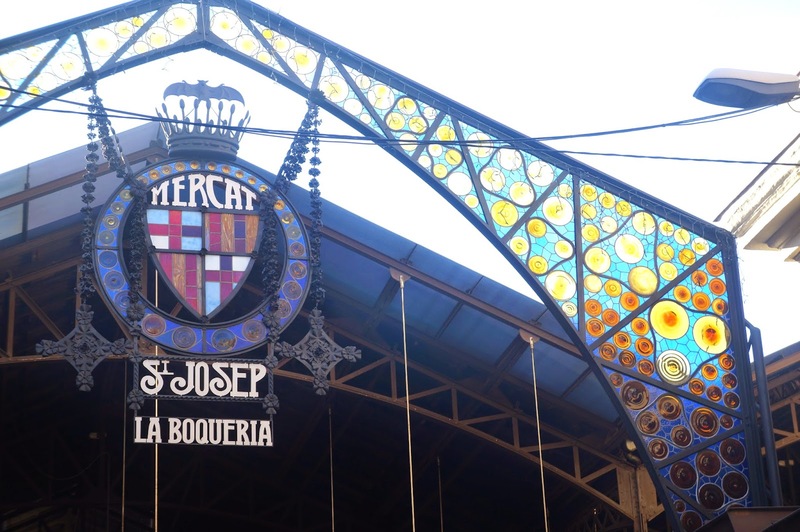 If you're in Barcelona I would say you should definitely visit at least one market and the La Boqueria happens to be the most famous one. This place was the first restaurant I visited when I arrived in Barcelona and definitely worth a visit. 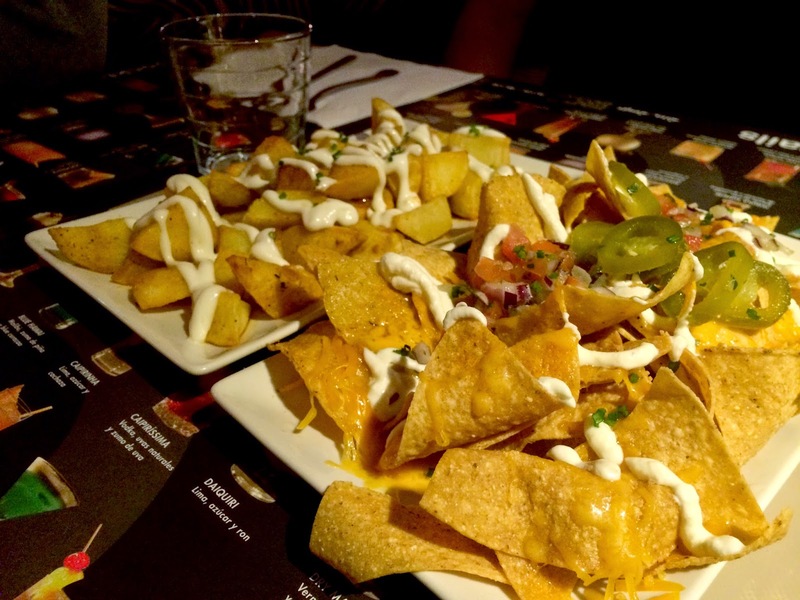 Since it was a Mexican restaurant, we had to order some nachos and chilli garlic potato wedges and both of the dishes were delicious (or maybe it was just because I was famished after the flight, I don't know). 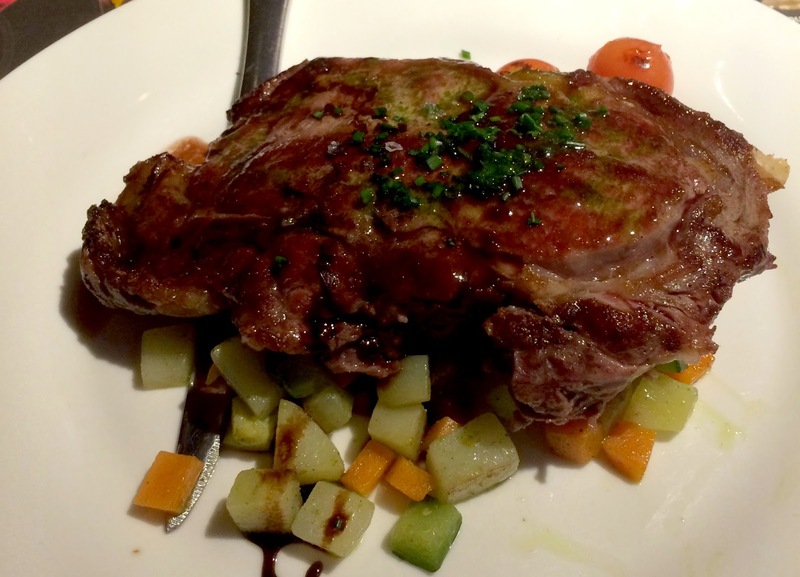 I don't think they sell entrecote in every Mexican restaurants, but this restaurant has a bit of international influences within the dishes and it was pretty good. 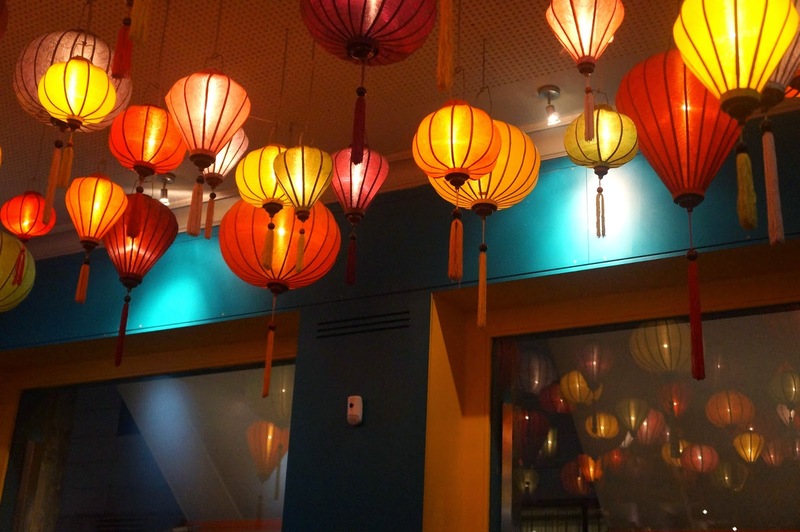 And you gotta love the interior of the restaurant. 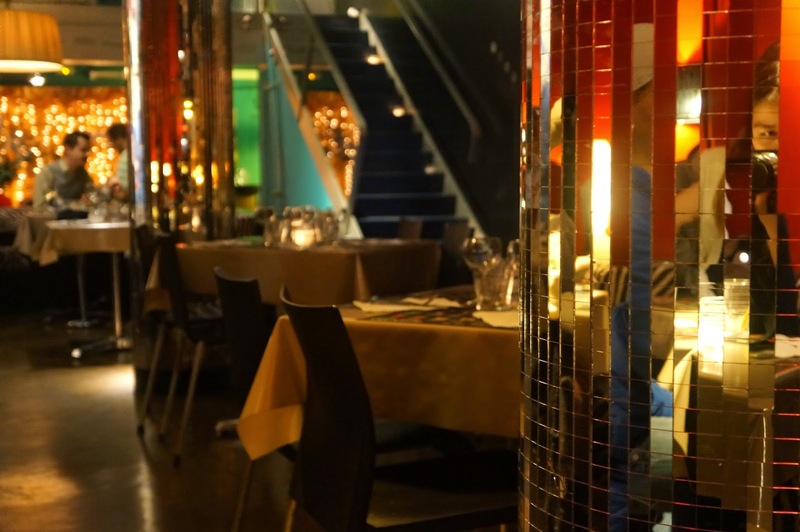 It's full of warm colours, mirrors and art. 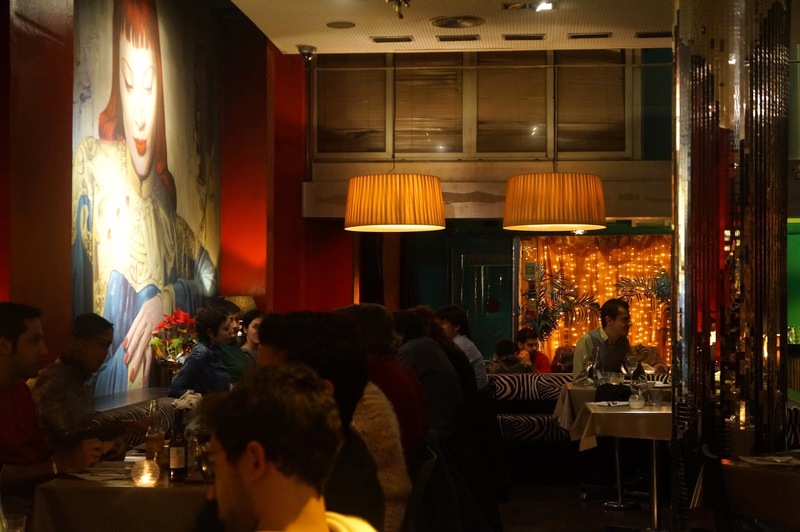 The main dishes are between 10 - 20 euros. 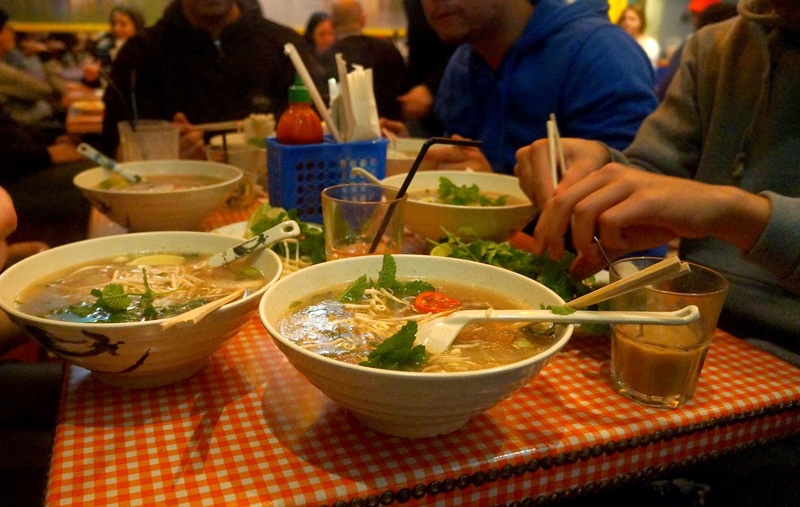 If you feel like eating Asian and want to take your time and sit cosily, you should visit this Vietnamese restaurant. 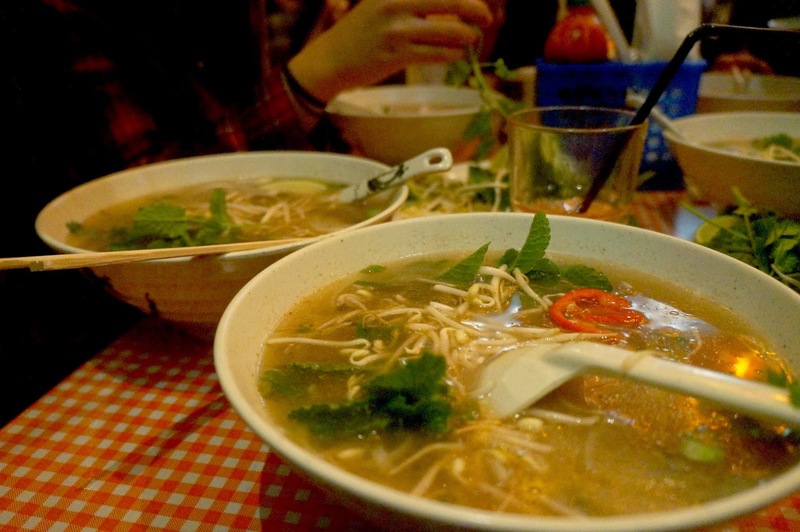 I don't think the dishes are really spectacularly good (I've had better pho in Amsterdam) but it isn't bad either. This place is special and worth the visit because of the nice setting and the relatively cheap alcohol. 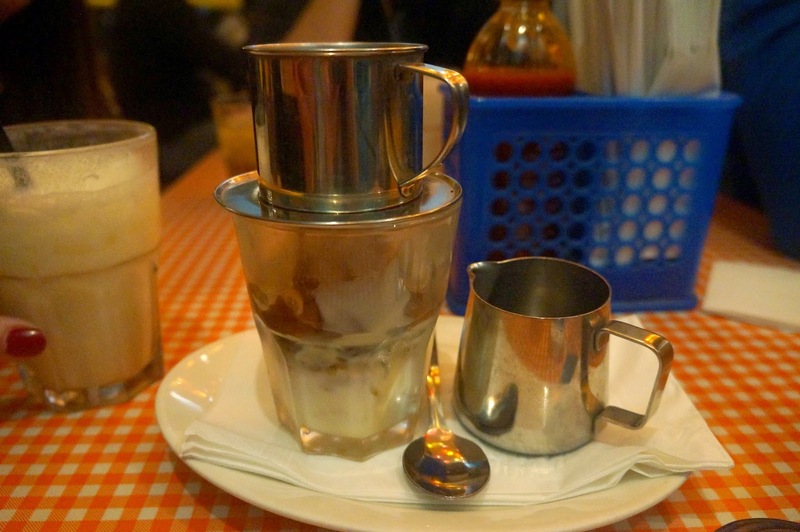 The place has the perfect balance between the fanciness of a restaurant and the authentic Vietnamese street food. Prices are between 8 and 10 euros for the main dishes. If you follow me on Instagram, you'd probably know that I'm a big fan of a good juicy burger. I try to try on different burger places, some are good some aren't so good, but this one definitely is in the top 5 places I've went so far. 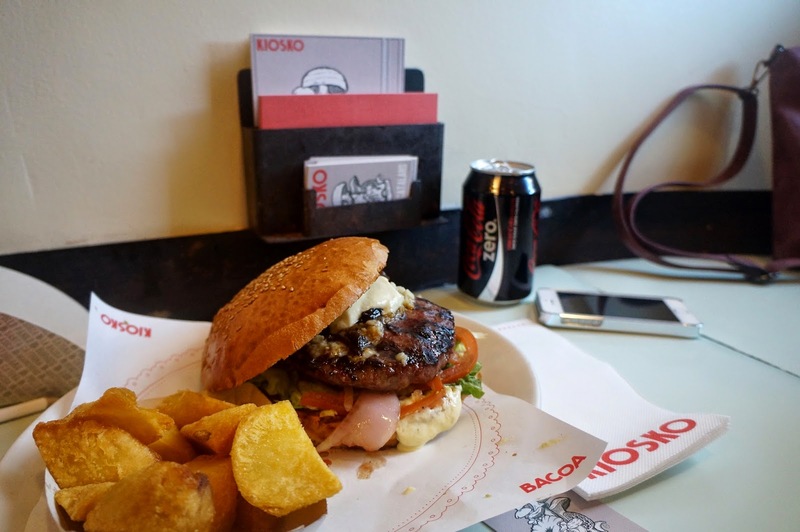 They have several places where they sell these burgers but I think the difference between Kiosko and the Bacoa places is that Kiosko is more of a takeaway/burgerbar whereas Bacoa are burger restaurants. 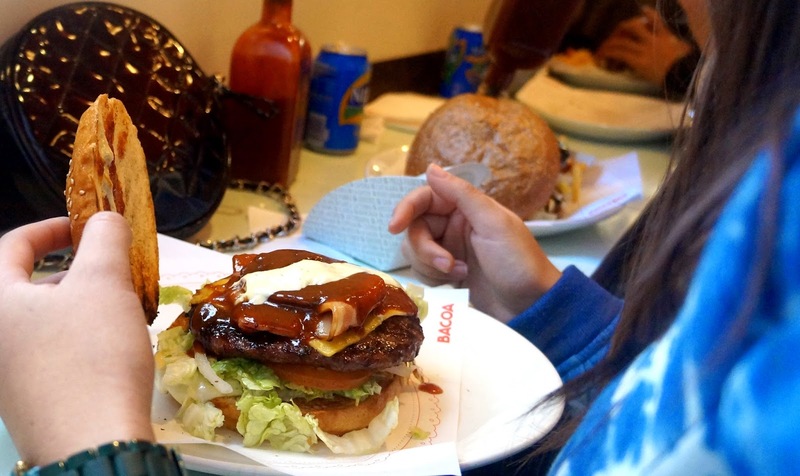 I haven't been into a Bacoa place myself but I like the crowded and cozy atmosphere of Kiosko. When you stand in line to order at the bar you get a checklist and a pencil to cross the burger you want, the type of bun and any side dishes. And when you've paid you get a number and they'll bring it to. With the meal you get a DIY carton where you can put your burger in to eat it without getting your hands dirty which is so smart and convenient. I actually wanted to visit this place again during the trip but unfortunately didn't get to due to time. 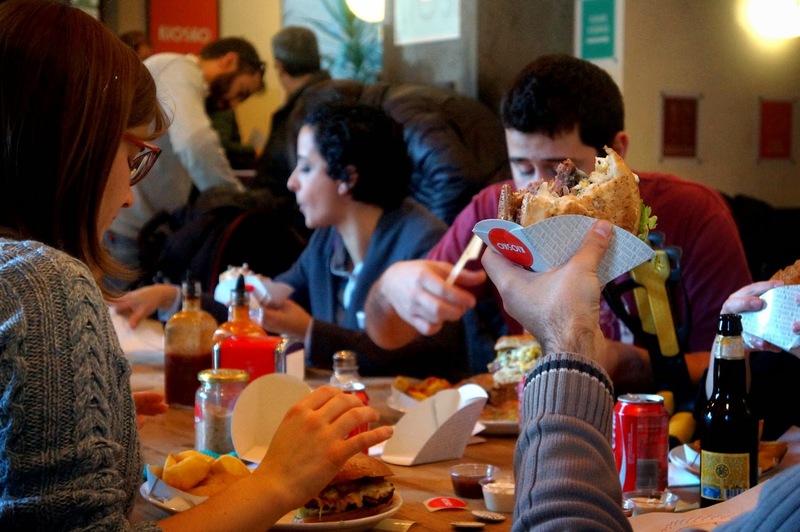 Price goes from 6 to 10 euros per burger. 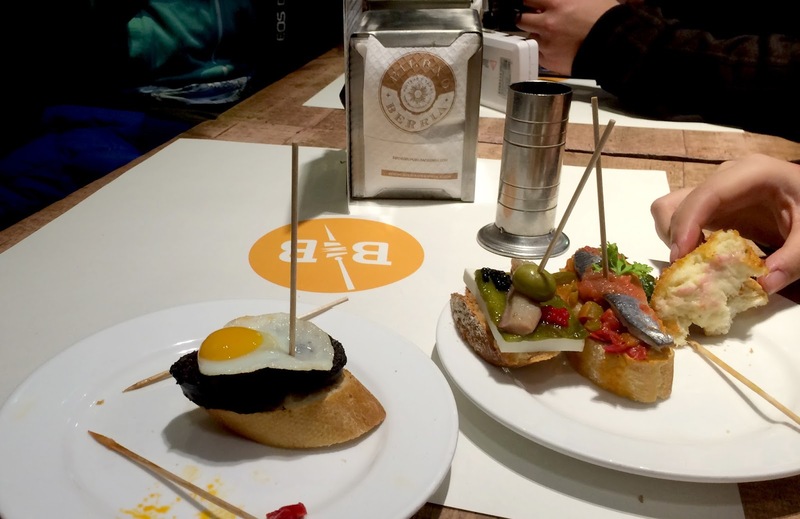 If you want to try something different and a quick/small bite then I suggest you to visit the 'Bilbao Berria'. 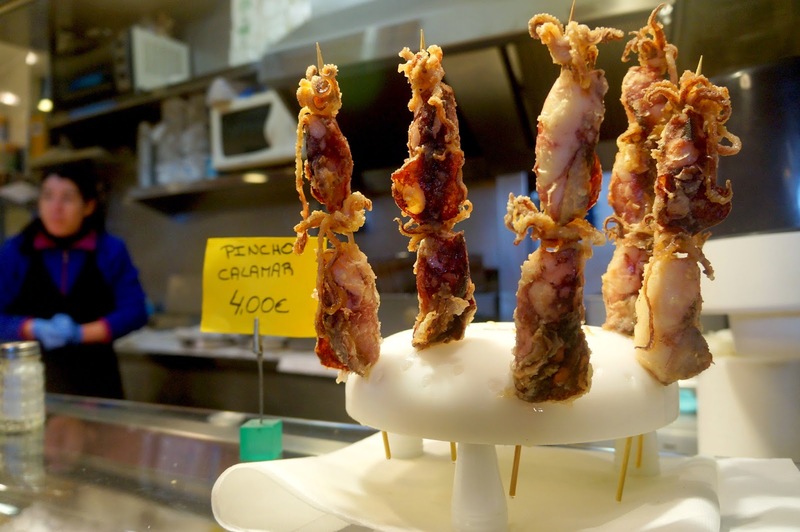 They sell pintxos, which is almost similar as tapas, on a stick. I like the concept of this bar/restaurant. It's an open buffet where they put all these different pintxos, you can grab any you want on a plate and when you're done eating you put all the sticks in a holder and they'll count the amount of sticks you gathered. 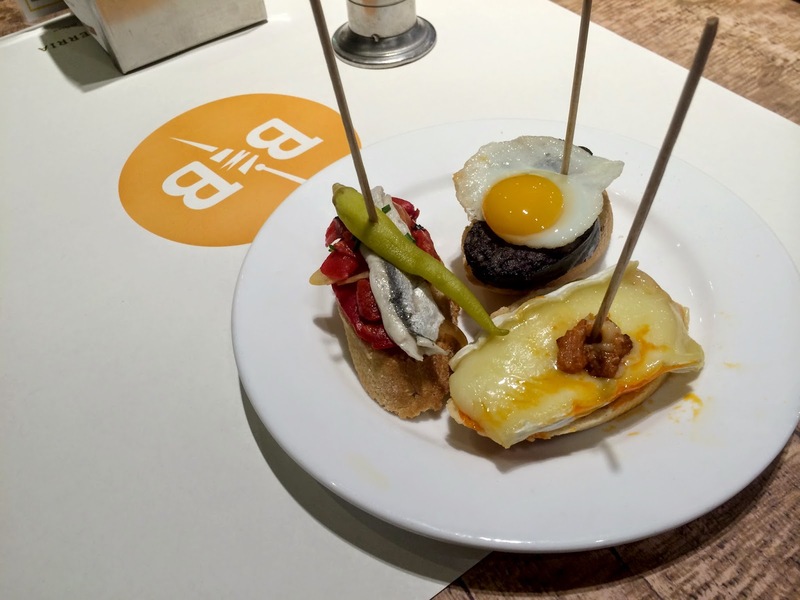 It doesn't matter what kind of pintxos you eat, they all cost the same. It can be expensive if you don't pay attention though but it's still fun to do while drinking wine or beer with your friends. This is the end of my little food guid in Barcelona. Before anyone of you ask, yes I did get to eat Paella and I liked it but since I don't really know much about it or how a 'real' paella should taste, I don't know if it's worth to mention or not. It's such a pity I didn't get to visit places as much as I've wanted. 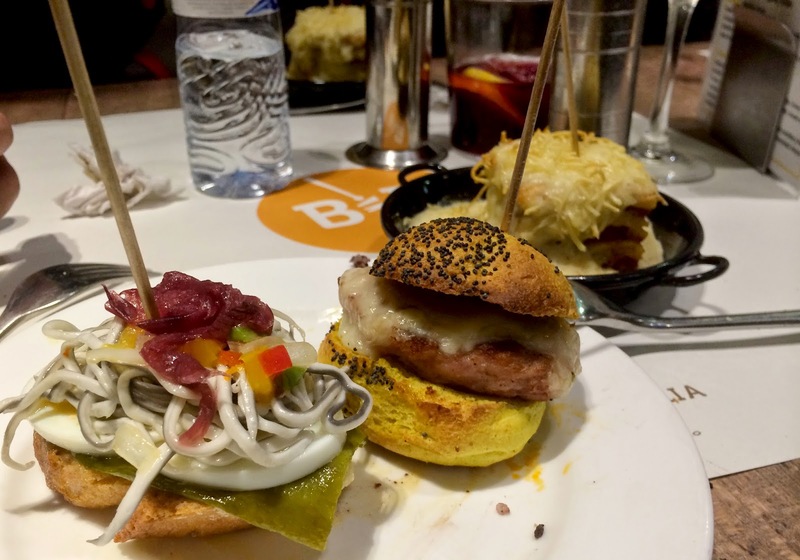 I've read some good reviews for other places in Barcelona as well, but there's always another time to visit! 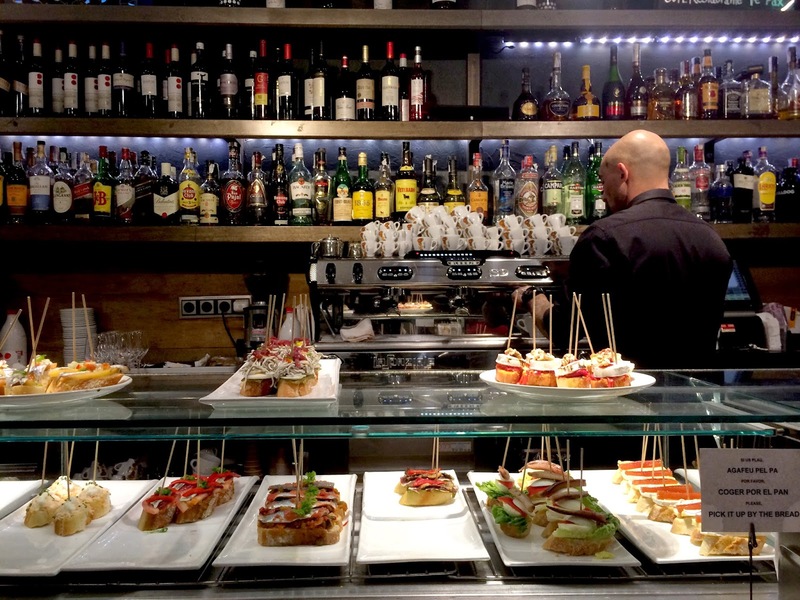 I hope I've inspired you guys to go visit Barcelona and try these places out. Wauw, dat ziet er allemaal echt heerlijk uit! Hele mooie foto's. I wish I had this food guide during my trip to Barcelona. Whenever the people in my group and I were hungry we would just wander aimlessly until we found a restaurant that seemed decent. La Boqueria was definitely one of my favorite places, though, because it's such a lively market. Thanks for sharing this wonderful guide. TRAVEL | Heading to Barcelona!